It’s no secret I often work with Valentia, I love their all natural& organic skincare products and I’ve been using them for years now. I was excited to try out their Night Revive Retinol Serum because the benefits of using retinol on the skin are endless. Retinol is a powerful anti-aging form of vitamin A that helps in cell turnover, collagen boost, unclogging pores, & reducing wrinkles and fine lines. 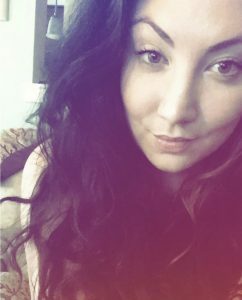 Even though I’m 26, creating a strong skincare routine, that includes anti-aging products, is important to me. A lot of retinol products, the more powerful ones, are prescription only- so when I realized that Valentia had a serum with retinol, I was so ready for it!! This particular product hones in on the power of vitamins C & E to prevent breakouts, improve skin tone, and combat wrinkles. Another main ingredient, squalane, helps to keep skin soft- I was unfamiliar with this ingredient before I started using the product, so I did some research. It’s an antioxidant that helps to promote cell growth and fight UV damage to skin. I’m sure I’ve used squalane in products before, but I never realized what it was until now. The Valentia Night Revive Retinol Serum has been an excellent addition to my nighttime routine. The serum absorbs quickly, and it is not sticky, which is something I take very seriously with my serums. The applicator is a dropper, which really helps you monitor how much you use- which is great because I sometimes use too much of a product at one time. This is yet another great product by Valentia, I highlight advise adding retinol to any skincare routine, and this Night Revive Serum is a perfect addition. For more information on Valentia visit their Facebook & Instagram pages! As many of you know I’ve partnered quite a few times with all natural & organic skincare brand Valentia. I’ve been able to test out a wide range of their products, you can find all of my reviews below, but this was the first AM moisturizer of theirs I’ve used, and to no surprise, I love it! 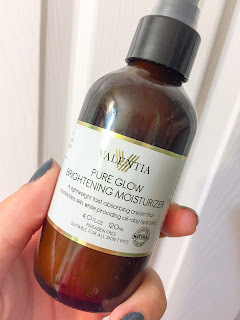 I’m including this Pure Glow Brightening Moisturizer in Budget Beauty because as I was browsing the aisles of Target & I noticed that the price of a good AM moisturizer isn’t what it used to be! To be honest I’ve been trying to use up so many samples & products that I haven’t actually purchased a morning moisturizer in quite some time. So, seeing the $25 price tag for this product is a bargain given the high quality, organic, ingredients. Since this is a brightening product it will help to correct any dark spots thanks to kojic acid, it also evens skin tone as the antioxidants and vitamins penetrate and treat your skin. The hyaluronic acid, which is super popular in many products lately, aids with strengthening elasticity and delivering moisture. Lastly, ginseng boots collagen so skin will look more energized, while Shea butter is a great hydrator, and is perfect for the change of weather we’re experiencing. No dry skin over here! The moisturizer is packed to the brim with great ingredients, and I love that I can feel how high quality the ingredients are when I apply the Pure Glow Brightening Moisturizer each morning. After using it for over a month I’ve had no issues with this product. My skin is bright and hydrated, and it works perfectly under makeup. No need to worry about this moisturizer making your skin oily while wearing makeup for an entire day, it’s a great base. The Valentia Pure Glow Brightening Moisturizer is luxurious, without breaking the bank. Oh yeah, & it smells spectacular. I love the scent of all Valentia products, fresh and sort of citrus-y. I’ve been super lucky to work with natural skincare brand, Valentia, on a lot of product reviews in the past couple of years. This is a brand I know I can trust, and I’ve never been disappointed by any of their products. Most recently I’ve been trying out their incredible Skin Detoxifying Clay Mask and their Clear Lift Revitalizing Serum. I’ve been using their Royal Rose Serum for a few months, but took a break from that about a month ago to switch to the Clear Lift Revitalizing Serum. Just like every Valentia product I’ve used I’ve had such a great experience from both of these products, and I can’t wait to continue to explore this natural brand. The Skin Detoxifying Clay Mask is now my once a week face mask, the main ingredient of Kaolin clay draws out skin impurities and exfoliates your skin, while hibiscus & cranberry fibers work to produce collagen and fight free radicals. This Skin Detoxifying Clay Mask definitely packs a punch, I typically apply this during my favorite time of the week, Spa Sunday. I leave it on for about 20 minutes, until the clay is completely dry. It’s super tingly and honestly, I feel like depending on how much work it’s doing, it can get a tad uncomfortable. BUT, not uncomfortable in a “bad” way, you just truly feel the mask doing its job. 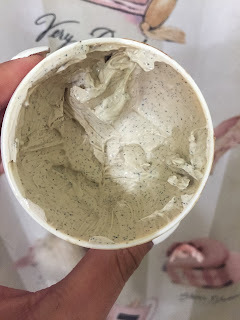 Valentia’s Skin Detoxifying Clay Mask is my #1 favorite mask at the moment, my skin looks fantastic after each use, and I can feel I’m getting that deep cleanse I need. I wouldn’t suggest using it more than once a week as it is more of a heavy duty mask, and it’s effects will last you until the next week. So, what does one do after finishing up with this Skin Detoxifying Clay Mask? 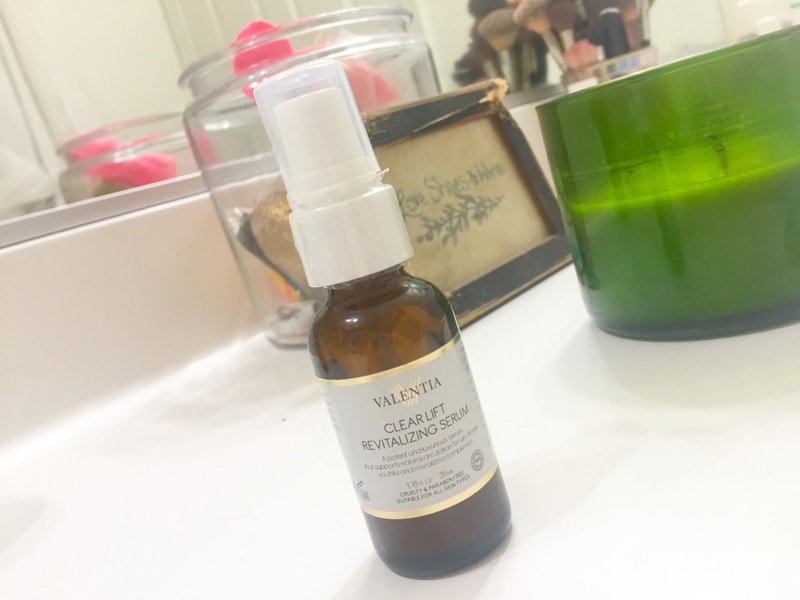 Well, for about the past month I’ve taken a break from Valentia’s Royal Rose Serum and I’ve been following up with Valentia’s Clear Lift Revitalizing Serum which has been a great brightening product for me. As summer makes it’s grand entrance for 2016 I try to minimize my makeup routine, and I need great skincare products to help me to do that. In reading about the Clear Lift Revitalizing Serum I was excited to see it’s brightening effects on my skin. The Clear Lift Revitalizing Serum also has a seaweed ingredient, Wakeme Bioferment, that helps with increasing oxygen to the skin. Overall this serum has been a nice new addition to my skincare routine, although I must say I enjoy Valentia’s Royal Rose Serum just a bit more because it helps manage my rosacea. I’ve worked with Valentia, an organic skincare brand, well over a year ago testing out their EvenGlow Serum with T C, and really enjoyed using it. So, I was super excited to receive their new Royal Rose Hydrating Serum, geared toward sensitive skin, in the mail, and couldn’t wait to start testing it out. Quite similar to the EvenGlow Serum, I found the Royal Rose Hydrating Serum lightweight and fast absorbing, which are critical for serums. & if you’re unfamiliar with serums, or why they are so important, it’s because the formulas are meant to deliver a high concentration of ingredients in a lightweight form, which is easiest for our skin to absorb. The quick it absorbs, the faster it can get to work targeting your skincare needs. 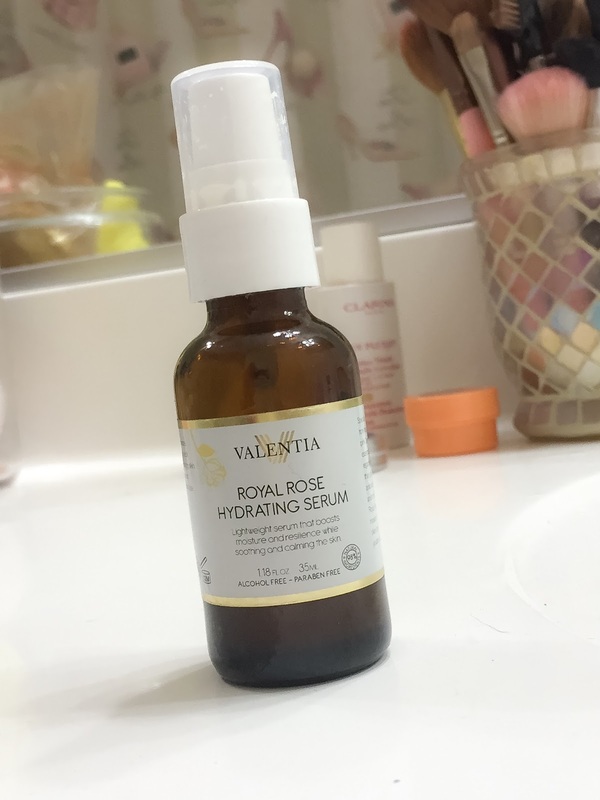 Also, serums can tend to be on the sticky side due to the ingredients within it, and thankfully this Royal Rose Hydrating Serum does not have this issue at all. The Royal Rose Hydrating Serum features Rosehip Seed Oil and rose Damascena are skincare ingredients that are excellent at delivering hydration to dry skin, and also promote a healthy and glow-y complexion. Vitamin B and lavender serve to heal and soothe the skin of issues such as hyperpigmentation, acne, scarring, etc, and bearberry helps to provide radiance to the skin. I’ve been using this serum twice a day for a little over 3 weeks now and I do notice how radiant my complexion looks during my PM skincare routine. The soft rose scent is an added bonus, it’s calming and not overpowering, perfect for bedtime! Use code GGLGP8RC to recieve a free Rosehip See Oil with any Valentia purchase. Use code U6KZNBQZ to recieve 10% off your purchase when you buy two or more Valentia products! If you know me you know I’m all about a good AM and PM serum, one that will deliver a serious punch of vitamins and antioxidants to repair my skin from the everyday stuff (to put it nicely) it encounters in the environment. 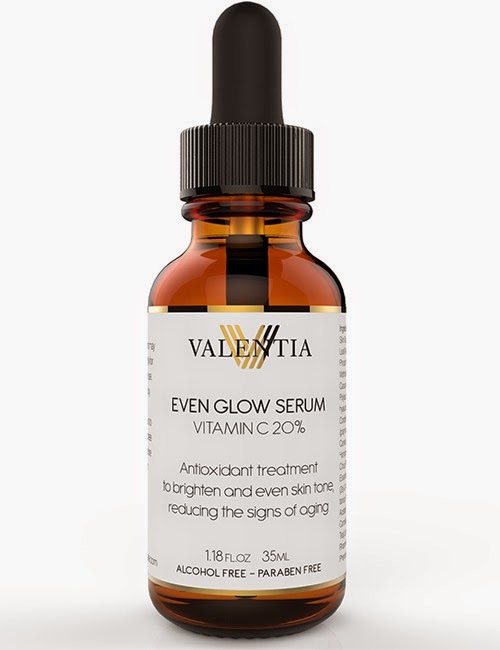 The Valentia Skincare EvenGlow Serum with Vitamin C is a serum I’ve been using each and every day for about the past month. The first thing that drew me into this vitamin C face serum product was its texture and consistency. It felt almost more like a moisturizer than your typical serum, a bit thicker and creamier than any other serum I’ve used before. My number one rule for serums is to not be sticky, and the Valentia EvenGlow Serum passed that test immediately. A small amount provided even coverage and absorbed quickly, and applying my moisturizer over it was easy and smooth. Also, the scent is a bit citrusy but not strong which is nice, some serums I’ve used have had a weird or just plain bad smell, and I’m glad this one does not- it’s not overpowering at all. The EvenGlow Serum combats uneven skin tone and provides hydration to the complexion- I think this product would be spectacular for the colder months when the weather is raw and can really affect the complexion. I can certainly say I’ve noticed the hydrating piece of the EvenGlow Serum, and I do feel very glow-y after applying it. I don’t have a huge issue with uneven skin tone so I can’t really speak to that, but overall I’ve really been enjoying this product. I’ll definitely be using this product until the very end, I love that it’s a bit different from your average serum that can be much more liquid based, and it’s packed with vitamin C which will boost my radiance. Interested in trying out Valentia Skincare? Check out the EvenGlow Serum on Amazon, it’s currently on sale for $35- an awesome price for a strong skincare product, I highly suggest it.